It’s a children’s picture book that actually looks like a comic book. There’s a grid of beautifully sketched black-and-white panels on each page of Jackie and the Shadow Snatcher, and the story is told entirely through dialogue balloons. Larry Di Fiori has worked as an illustrator on some picture books using the Muppets. But in this book, he seems to reach back all the way to the 1920s, telling a long fantasy-adventure story that could’ve been serialized during the golden age of the Sunday newspaper’s comics section. 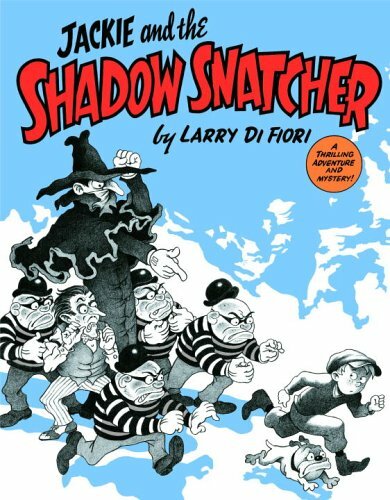 The book is titled “Jackie and the Shadow Snatcher,” and there’s even a bubble on the book’s cover that describes it as “A thrilling adventure and mystery.” There’s criminals wearing the traditional black and white stripes and an eye mask – and an old-fashioned bowler hat. The book opens innocently, with a boy named Jackie in a cap walking past the smokestacks on the edge of town. But if you study the picture carefully, you’ll see something strange happen to his shadow. First it’s in front of Jackie, and then it’s to the side of him – and then it’s just a pair of shadowy legs kicking as they’re dragged into a tree! The magic of the story makes it instantly intriguing, and the simple characters are still funny to watch. It’s as though it’s taken the best elements of a comic book, and then transported them into a children’s picture book. For example, because the book’s illustrations are black and white sketches, the book is ultimately filled with lots more pictures than usual. And with all the accompanying extra dialogue, this book could keep young readers occupied for a longer period of time! Ultimately the story finds his way to the spooky mansion of the shadow snatcher – the hide-out for a criminal mastermind and his gang of thieves. The illustrations suddenly get more grand and fanciful, and the final showdown is very satisfying. And my favorite illustrations shows the glorious liberation…of all the stolen shadows.